Winds of Lindy: What's in Your Closet? I tend to fluctuate weight too much. I know, this can't be healthy. I seem to lose and gain effortlessly. Well, relatively. I go through a holiday like Christmas and pig out. Which is followed by season and season of Chocolate. Then in the spring I enjoy the sunshine and get out more and feel great and get fit. I give it all I've got when I have a motivation like a trip or stage appearance or race. Then I have no catalyst anymore and, even though I declare healthy feels amazing and I'll never go back, I always wake up one day and say what happened? So I have clothes of different sizes. And I can't seem to let go of a few items that don't fit. In case one day they do fit. I keep telling myself to get rid of anything that is too small and if I lose that much weight I can just buy new stuff. Out with the old, in with the new. I could probably do away with a large portion of my clothing. I am obviously not fanatical about being with the current fashion trends. Of course, I don't want to look too outdated or like I don't care, but it is the opinion of average folk that I would take, not someone always up-to-date on the latest thing. Because really, I don't even like some of the current must-haves. Even though I am not trapped in following the vogue of pointy shoes or square, large headpieces or loose headbands, I do find that my preferences are somewhat subconsciously swayed. I'll see something that looks good on someone else and want to try a similar item. I remember I once bought a dress in Vegas and saw the exact dress worn by two supporting actresses in not one but two different blockbuster movies. I was ecstatic and still love that dress! (I know. Silly. And, I'll guarantee, its spotlight is over.) I will absolutely adore one shirt one year but not feel right it in the next. Sometimes I'll look at it and even say, "Really? You thought that was one of your best pieces?" Today I was trying to find a running top that had long sleeves as it was cool and I was going for a hike. I had a few but they were all too short. Apparently, back when they originally made their way into my drawer, shirts didn't have the length. There is a fashion stage I do not miss! Sure some fads are temporary (or cyclic), like high waists or ankle legs or flowing tops. But, whether they are in or not, these styles still compliment, to an extent, a large assortment of figures. The low pants with the short shirt, on the other hand, is only made for some people. And society tried to get by that by declaring, "Do it anyway! Show off what you've got!" I am not saying the rest of us had nothing good to show. But a different style of clothing would highlight the positives much, much better. Therefore now, I surmise, there are millions of photographs in existence that will be despised more and more as time goes on. And there's my critical statement for the day! Back to my own closet. I am disliking its contents increasingly each season. I am pretty sure this is typical female behavior. 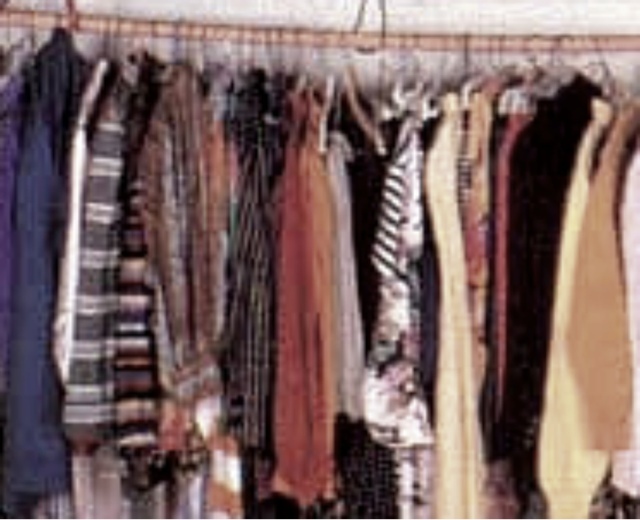 "I have nothing to wear (in my walk in closet)!" But also, akin to plenty of mothers like myself, I don't have the budget to refresh my options. I work 16 hours a week and a third of that goes to childcare. But I've decided that nothing is going to change if I just pout and leave it alone. Like really, as I said, I will probably never wear some of it. I need to take a large bag, go in there and remove anything I haven't worn in the last year. Even as it protests you once felt beautiful in me at a wedding or you got me for less than half price or I was previously worn by someone very affluent in the community. So what! Your day is done! I can't make myself accept the need for new if I don't get rid of the old. I can't be more positive if I refuse to stop thinking the negative. I can't grow into my potential if I hold out on forgiving myself. I can't make room for healthy meals if I keep bringing crappy options into the house to fall back onto. I can't appreciate my husband's growth if I focus on past failures. I can't watch my mom's relationship blossom with her grand daughter if I focus on my childhood hurts. People change. Styles change. Paths change. Life is always changing. And it is supposed to have vicissitudes. It forces us to adapt and grow. And if we let that happen we can experience the unimaginable, fresh new trails in store for us to unearth. I wonder what fresh, newfangled items garage sales will have in store for my closet this year?